Casa Marreco is a modern, spacious 4 bedroom villa located in the grounds of the Quinta de Santana estate. 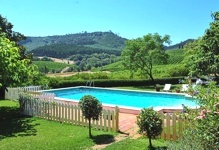 Its splendid gardens with fruit orchards, terraces with panoramic views over the valley and extensive vinyards which produce the Quinta’s own wine, make it the perfect location for a relaxing Portuguese holiday. Casa Marreco is in a secluded part of the estate. Guests enjoy their own private patio, garden and swimming pool. Casa Marreco is beautiful, modern villa which has been tastefully decorated in a traditional, Medditerranean style. Its large, confortable lounge/dining room, which features an open marble fireplace, offers panoramic views across the valley. Also on the ground floor is a fully equipped kitchen and a separate utility room with a washing machine. Casa Marreco has four bedrooms, all with french doors leading onto terraces. On the ground floor the master bedroom and a further twin bedroom both have ensuite bathrooms. On the first floor there is a double bedroom and a twin bedroom which share a large bathroom with a free standing cast iron bath and a separate 'walk-in' shower. Casa Marreco has central heating (extra charge) and free wireless internet. Cots, highchairs and other facilities for children can be provided on prior request. For larger groups, there are additional 2 and 3 bedroom villas on the estate which can also be rented: Adega, Caseiro and Lemon. Casa Marreco is located on a large, historical estate, parts of which date back to 1633. A large part of the estate is used as vineyards and in other parts eucalyptus trees, fruit orchards and meadows are in abundance. This villa is in a secluded part of the estate. Surrounded by a beautiful private garden with panoramic views over the valley below, it is a perfect spot to relax. From the rear of the villa, stone steps lead from the lawned area to the villa’s private infinity swimming pool. There are plenty of sunloungers surrounding the pool for guests' use. The lawned garden at the rear of the villa has a shaded, paved patio and barbecue area which is completely fenced off, ideal for children. Gradil, the pretty local village, offers basic supplies and a few good restaurants, all within walking distance from the estate. Larger shops can be found in Mafra which is approx. 15 kilometres away. The beautiful long sandy beaches of the west coast of Portugal are approx. 25 kilometres away. Ericeira, famous for its seafood and fishing restaurants, has the closest beach to Casa Marreco. The villa is well located to visit the many interesting places within an hour drive. These include Lisbon, the religious shrine at Fatima, the convent of Alcobaca, the monastery of Batalha, the medieval town of Obidos and Sintra famous for its wonderful palaces. In addition there are local markets, the Golega horse fair and other places of beauty and historic interest.